The apple doesn’t fall far from the tree. In this case the apple is Donna Appel and her 90-year-old mother, Evelyn Chernetz, is the proverbial tree. Both actively volunteer in Broward and Palm Beach counties. VetAssist Vice President Donna Appel and her mother Evelyn Chernetz at the ARDC Council Installation Dinner January 17, 2019 at the Renaissance Fort Lauderdale-Plantation Hotel. Donna has always believed in giving back and volunteering. That’s why you can find her involved with a mentoring program called Take Stock in Children, the Steppin Up Shoe Project, which has collected more than 13,000 new shoes for area youth in need, and the local area agency on aging known as the Aging and Disability Resource Center (ARDC) of Broward County. Recently Donna received an award for serving two years as vice chair and two years as chair of the ADRC’s advisory council and of course she brought her mother Evelyn with her to the award ceremony. Professionally, Donna is the vice president of sales and marketing at Veterans Home Care with the exclusive VetAssist Program. The VetAssist Program not only offers home care and adult day care, it also assists veterans and their surviving spouses in accessing military benefits to pay for their care. There’s a little-known pension called “Aid and Attendance“ and it can cover the cost of long-term care up to $2,230 per month. This pension is offered through the Veteran Benefits Administration (VBA) not the Veterans Health Administration (VHA). “The problem is that so many deserving veterans and surviving spouses of deceased veterans are unaware of it,” says Donna. “When I volunteer at the ARDC, sometimes I’m acting as fundraiser, organizer, and volunteer. If asked, I act as a VetAssist vice president, and spread the word about our program which has helped more than 16,000 veterans and spouses nationwide since 2003 obtain Aid and Attendance to pay for their care,” says Donna. After stepping down as chair, Donna will continue as advisory council member at the ADRC. “I love this organization. Everyone on the council is a subject matter expert and resource to area seniors. For example, I volunteer with people from Florida Power and Light, Medicaid, PACE, the police department, the Alzheimer’s Association, an adult day care provider and other home care providers. We share information and do whatever we can to improve the lives of our seniors,” says Donna. “People who aren’t able to volunteer are missing out. I know it’s a cliché, but you really get back more than you give. At least that’s been my experience. I’ve met so many friends including elected officials and other volunteers who I wouldn’t have otherwise met,” says Donna. One of her favorite events is coming up in February: the 13th Annual Valentine’s Day Fashion Show and Luncheon, Friday, February 8th, 2019. “I love working with Stein Mart our sponsor and I get a kick of the local celebs and elected officials who attend and even model the latest fashions,” says Donna. Photo- Courtesy of South Florida Sun Sentinel & photographer Kara Starzyk. 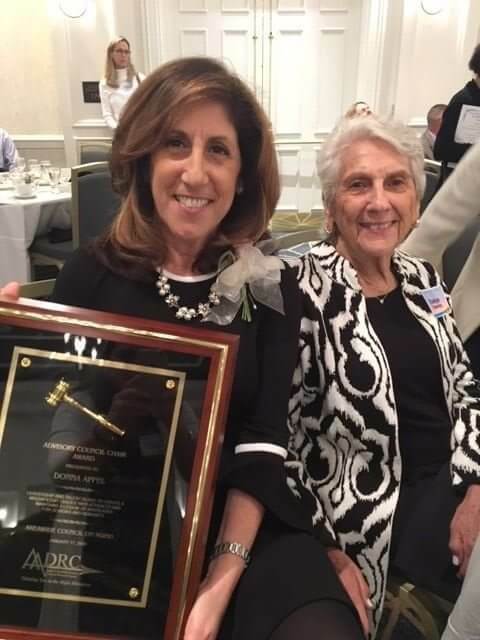 Donna Appel, pictured second from the left in the back row, applauds Edith Lederberg, former executive director of the ARDC in Broward County, as an amazing role model. Edith passed away January 8, 2019 after more than 40 years serving her community. “Between my mother and Edith, I’ve certainly been blessed with role models of community outreach,” says Donna. The ARDC offers information regarding services in Broward County available for seniors, persons with severe and persistent mental illness, ages 18 and over, their families, and caregivers. The ARDC helpline is 954-745-9779. For information about the VetAssist Program, for veterans or surviving spouses of deceased veterans, call 888-314-6075.